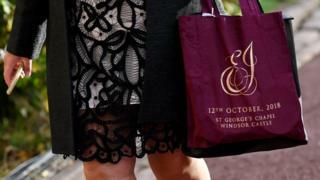 A number of gift bags given to wedding guests of Princess Eugenie and Jack Brooksbank are being sold online. Around a dozen bags are up for sale on the website eBay, with asking prices of up to £1,000. The bags were given to the 1,200 members of the public chosen by ballot to follow proceedings from the grounds of Windsor Castle. The bags contain items such as orders of service, fridge magnets, ponchos, shortbread and chocolate coins. One online listing says it offers the "chance to buy your very own piece of British royal history". Friday's wedding was also attended by 850 private guests, who were not given gift bags. Among those 850 were celebrities such as model Cara Delevingne and singer Robbie Williams. Gift bags were also given to the 2,640 members of the public invited into the grounds of Windsor Castle for the Duke and Duchess of Sussex's wedding in May. A number of those gift bags were also sold online, with many auctions fetching more than £1,000.